I have lived in San Leandro for over a decade, and yet I’d never gone to Sabino’s Cofee – even though it’s a San Leandro institution. This is not terribly surprising, it’s not within walking distance of my house and I do spend too much time at Zocalo as it is. I love Zocalo, but it’s not always the best place to go when you want to have a private conversation as you are bound to run into someone you know. So, when Aamani and I got together this morning for some girl talk, I suggested we give Sabino’s a try instead. It was a great choice. 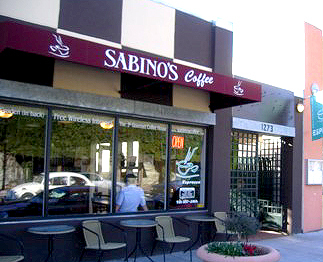 Sabino’s is a super small cafe on MacArthur Ave. It has a tiny sitting room around the bar area, and a simple small patio on back. That’s where we headed on this beautiful spring morning. We sipped our very good caramel lattes ($3.50 for a double) and relaxed and talked for a couple of hours with no disturbances at all. It was heaven. I will definitely be coming here again.